Basmati is one of the best known varieties of rice out there. The word "basmati" comes from the Sanskrit word "vasmati" which means "fragrant" or "aromatic." 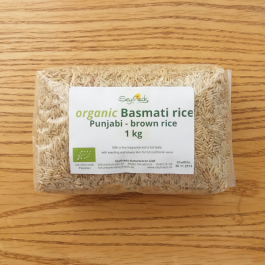 Long-grained, extremely aromatic, with a light nutty flavour, basmati is grown in the north of India and Pakistan, mainly using traditional growing methods. Rice is not only a staple food around the world but is a cultural symbol for fertility, health and wealth in many countries. In our own country it is customary to throw rice at a newlywed couple, symbolizing wishes for fertility and prosperity. In India it is believed that Lord Vishnu caused the Earth to give birth to rice, and that the god Indra taught the people how to raise it. Rice is used for worship, and colored powdered rice is used to create beautiful works of art in the form of mandalas in the Far East. In these countries, rice is treated with reverence and associated with elaborate planting rituals. There are several dozen varieties of rice. Some of the common varieties of rice include jasmine, Texmati, Calmati, Japanese, arboria, brown rice, wild rice and basmati rice. 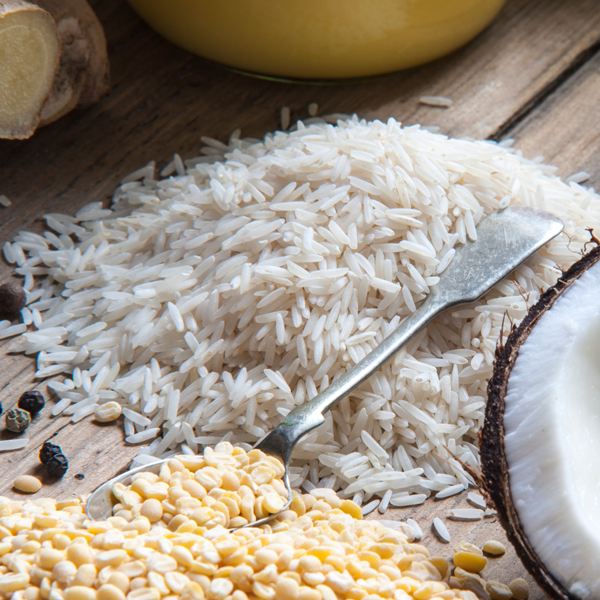 White rice is considered easier to digest in ayurveda. According to ayurveda, basmati rice is the king of all rices. Basmati rice is sattvic, or pure; it balances all three doshas; it is nourishing for the body tissues; and it is easy to digest. Aged basmati rice has an aroma and flavor arguably the best in the world. Ayurveda recommends avoiding rice that is parboiled, instant or pre-cooked because is has less nutrition and less prana, or life energy, in it. Rice contributes the sweet taste, according to ayurveda. It is a light, soft, smooth and nourishing food. It is cooling in nature. Rice is generally good for balancing Vata and Pitta. It may create excess mucus, so rice in excess is not considered ideal for Kapha. 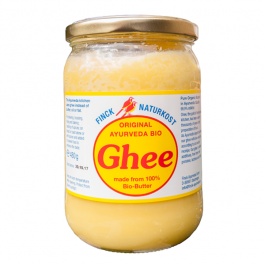 To balance Vata, eat rice that is cooked well, in plenty of water, and add a dash of ghee to the cooked rice. Desserts made with rice and milk are particularly cooling and balancing for Pitta. 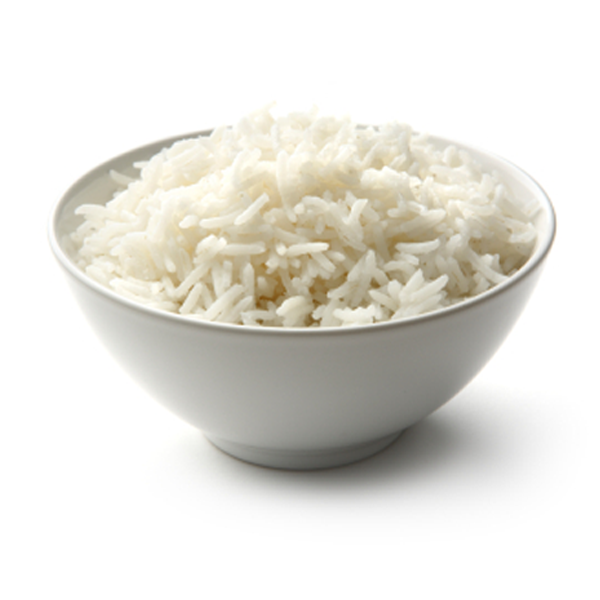 Individuals trying to balance Kapha should eat less rice, and dry roast the rice before cooking it in water. Use the best quality basmati rice you can find and afford. 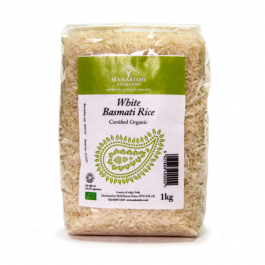 Maharishi AyurVeda organic basmati rice has been sourced carefully for its quality. Rinse the rice for a few minutes. The water does not need to run perfectly clear, like when rinsing Japanese rice, but rinsing helps get rid of starch that can make your rice sticky. Add salt to the rice in the pot, before pouring in the water. This helps the salt absorb into the rice grains. Do not add salt after the rice is cooked, as your rice can taste overly salty. Try pouring in boiling water over top of the rice in the pot, which helps me keep track of the exact quantity of water you need, and there is no loss of water due to evaporation in your pot. Use a tight fitting lid, or ideally, use aluminium foil, crimped tightly over the top of the pot to make a good seal, so that steam doesn't escape. The tightly covered pot lets the rice steam perfectly, and the method consistently yields long, separate, perfectly steamed fluffy grains of rice. Basmati Rice - 1kg pack. The level of inorganic arsenic in our organic basmati rice has been tested and it is lower than the maximum level permitted for use by children.